If you have a cat, chances are your furry little friend likes to fall asleep wherever it pleases — including on top of you. This is pretty common behavior for felines, but why do so many cats like to lay upon your lap or chest and purr themselves to sleep? Does feeling safe and secure come into play? Does snuggling with you ease your cat's mind, knowing nothing bad can happen if he's near you? Have you ever noticed how your cat loves to catch the first ray of sunlight in the morning? Whether it's on the floor or by a window, your cat is right there soaking it all up. This is because cats prefer resting in warm places. According to Dr. Fosters and Smith, temperature receptors of cats, especially their faces, are especially sensitive, so cats love seeking out heat. 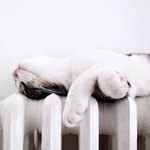 Cats seek out external heat sources so their bodies don't have to work as hard to maintain a base temperature. This may be why you might wake up with your kitty on your head, because your head is the warmest place! Cats love warm spots, you included! Cats sleep around 15 hours a day or more, so naturally they're looking for a comfortable spot to catch a few winks. Whether it be on a sofa or stretched out in a laundry basket, cats require a soft and cozy place to relax. Imagine how cozy you feel to a cat who discovers you in bed under a number of plush blankets. Your belly immediately becomes the coziest place on earth, far superior to a mere pillow or cat bed. If you're like most people, you're typically out most of the day (or night) working. When you finally return home, all your fur-ball buddy wants to do is be by your side and follow you around until you sit or go to bed so he can climb on top of you. Why? Because your cat loves you. Marilyn Krieger, a cat behavior consultant in Redwood City, California explains these behaviors: "This is the cat showing trust for the person." All that head butting of your face, all those purrs and kisses; they add up to one thing — adoration! So when your cat shows these signs of affection and when he jumps on you to make his bed, give him a little pat to lull him to sleep and return the affection. Everyone and everything craves and needs security. Your cat is no exception! When your cat is in search of a place to sleep, he not only wants comfort and warmth, he also wants a place that is secure. No dangerous predators are around when his favorite person is there, so kitty dreams come easily for your cat when he has nothing to fear. Cats love sleeping near people they consider "theirs"
Cats are territorial creatures, and often want to mark their favorite people as their own. Consider your pet sleeping on you as indication of their trust, since your kitty considers you the safest place.